Avoiding unauthorized practice of law: How much attorney supervision of paralegals is required? You have committed one of the greatest crimes in the universe. You ran short of money! Now, you have been served with a lawsuit by one of your creditors! You imagine the horrible consequences: You will be hauled, in chains, before a harsh judge and mercilessly grilled with embarrassing questions. A scowling deputy sheriff will show up at your door step to seize what few personal possessions you still own. Your bank accounts will disappear. You will lose your job. You will be tied to a stake in the public square where people will spit at you. You may even be hauled off to jail for a few years! Well, it truly isn’t that bad. 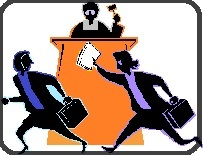 Discover your options in a collection lawsuit; Yes, you have options! Learn how to enforce your rights! You can survive a collection lawsuit. Download our Free Guide and find out how! What are my debt relief options? Do I have any? Should you do debt settlement or bankruptcy? How do they compare? You loaned someone money and they filed Bankruptcy: What can you do?